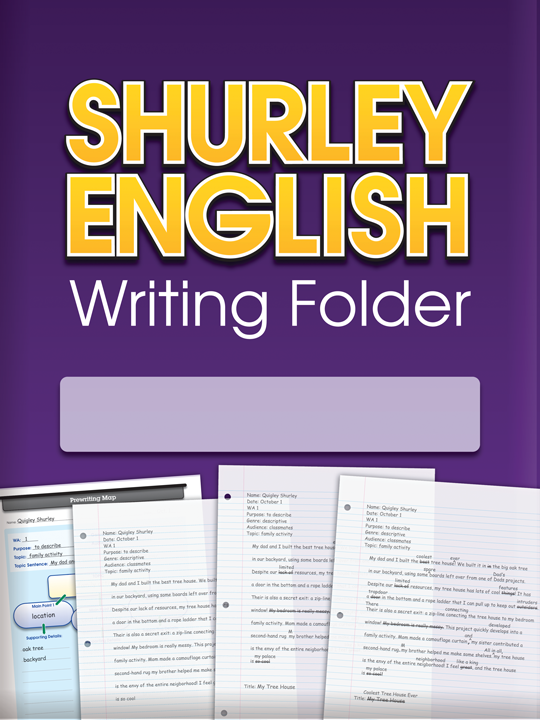 The Shurley English Writing Folder will help your students move through the writing process with ease. This foldout, four-pocket folder keeps students organized with a dedicated space for their prewriting, rough draft, revised draft, and edited paper. It is packed with handy references, checklists, and tips to ensure students have exactly what they need to produce a polished piece of writing. helps students learn all the steps of the writing process, until it becomes second nature. keeps the most important writing strategies and processes front and center during writing time. provides detailed graphic organizers so students can organize their ideas logically. teaches students how to revise and edit their own writing in a step-by-step manner. develops students’ vocabulary in order to empower them with word choice that is both deep and wide. hones students’ use of accurate academic language in the field of writing. builds confidence and competence as students review each panel systematically throughout the year. Shurley English Writing Folder: © Shurley Instructional Materials, Inc.
Shurley English Writing Folder: ©Shurley Instructional Materials, Inc.
To add the Shurley English Writing Folder to your ELA classroom, simply call with your credit card, email your School Purchase Order, or visit our online store today! Kim Shurley is a wife, mother, educator, and wanna-be rockstar. She graduated with honors from the University of Arkansas-Little Rock with a degree in Marketing in 1999. Upon her graduation, Kim joined the Shurley Team, where she collaborates on product development and promotion with her mother-in-law, Brenda Shurley. Kim believes wholeheartedly in the work she does in curriculum development, which is why she homeschools her two children in the summer months using the Shurley method of instruction. After all, educating children is what this family-run company is all about. In her spare time, Kim can be found adventuring in the mountains of Colorado with her family.